Del Webb Orlando in Davenport, Florida is an active adult neighborhood within the master-planned golf course community of Ridgewood Lakes. Pristine lakes, mature trees, and the scenic 18-hole golf course create a tranquil atmosphere. This gated community is open to adults aged 55 or better and has a clubhouse with a full-time activities director, clubs, classes, and a small park. With 830 homes planned for completion, this age-restricted community is sized to accommodate a broad spectrum of interests and yet maintain a close-knit atmosphere. This active adult community is close to fine dining, endless shopping, medical facilities, and plenty of Orlando's world-class theme parks. The community originally opened in 2007 under the name La Cresta by Del Webb but was later changed to Del Webb Orlando. Montecito is the incredible 30,800 square-foot clubhouse that offers a superb lineup of amenities. All year long, active adults can stay fit by utilizing the state-of-the-art fitness center, aerobics and dance studio room, indoor walking track, and indoor pool. The Montecito clubhouse also offers daily fitness classes that allow residents to maintain an active and healthy lifestyle. There are plenty of other areas within the Motecito clubhouse where residents can socialize with other neighbors or relax on their own, such as the gathering room, arts and crafts room, hobby and game room, card room, billiards room, cyber cafe, library, wall street room, and ballroom. Outside activities include two tennis courts, a half-court basketball, four pickleball courts, three horseshoe pits, and four bocce ball courts. Residents can play a friendly match or make it interesting by competing with a fellow neighbor. An outdoor pool with a spa are great for relaxing and pampering after an exciting day of activities. Del Webb Orlando also has a fishing dock where residents can catch lots of fish. Golf enthusiasts will be pleased to live within close proximity to the public 72-par Ridgewood Lakes Golf Course. The golf course was designed by Ted McAnlis, which is sculpted on rolling ranch land and features water or wetlands on each hole. There are a variety of optional membership levels for residents to choose so they can play at their leisure. Homes in the 55+ community are no older than 2007 and range in size from 978 to 2,251 square feet. Homebuyers can select from a variety of single-family homes that are available as new construction and resale. These open floor plans accommodate active adult buyers who are looking low-maintenance homes. Homes feature one to four bedrooms and one-and-a-half to four bathrooms. Most of these single-family homes are one story, although some have optional second-floor lofts that provide additional bedrooms or bathrooms. Residences have attached one to two-and-a-half-car garages and spacious lanais. Large walk-in closets, breakfast nooks, kitchen islands, dens, elevated doorways, and formal living and dining rooms are only some of the desirable features that active adult homebuyers would want or need. Del Webb Orlando provides the perfect Florida lifestyle with never a dull moment with numerous clubs, classes, and activities. A dedicated lifestyle director keeps a packed schedule and plans lots of interesting things to do, such as cigar group, water volleyball, computer club, yoga, Zumba, meet and greet breakfasts, seasonal events, and holiday parties. For a slower pace, near the Del Webb Orlando entrance is the Tree of Life Park, a serene oasis with a shady oak tree and a bench. Here, residents are often seen enjoying some quiet time over a favorite book. Davenport is just minutes away from I-4, Florida Turnpike, Highway 417, and Highway 429 as well as Orlando and all it has to offer. Grandchildren will especially like Disney, Universal Studios, and Sea World. Other attractions include hot air balloon rides, casino boats, fishing charters, and airboat rides. For cultural and educational enrichment, residents can visit Harry P. Leu Gardens, Fantasy of Flight, Historic Book Sanctuary, Orlando Science Center, Kennedy Space Center, Central Florida Zoo, Orlando Museum of Art, and the City of Orlando Cultural Arts Section. The latter hosts pottery, art, and clay events. Residents have plenty of options to get their shopping done. In addition to eclectic shops and boutiques, Orlando Premium Outlets, The Mall at Millennia, The Florida Mall, and Posner Park are popular destinations. With so much to do and everything close at hand, residents in Del Webb Orlando can truly live an active and maintenance-free lifestyle. Montecito Clubhouse - 30,800 Sq. Ft. Residents can play at the public golf course that is in close proximity to Del Webb Orlando. Membership is optional. There are plenty of activities available in Del Webb Orlando. Here is a sample of some of the clubs, activities and classes offered here. The single-family homes in the Garden Series offer 978 to 1,598 square feet of living space. These homes have one to three bedrooms, one-and-a-half to three bathrooms, and one to two-car garages. These homes are available as new construction and resale. Single-family homes in the Generation One Series offer 1,515 to 2,251 square feet of living space. They have two to four bedrooms, two to four bathrooms, and an attached two-car garage. Some models offer optional second floor lofts. Some of these models are available on a resale-only basis. The Classic Series features spacious single-family homes with optional second-floor loft spaces. These homes range from 1,600 to 2,159 square feet and have two to four bedrooms, two to four bathrooms, and an attached two or two-and-a-half-car garage. These homes are available as new construction and resale. Please Note: Not all floor plans are available at this time. After visiting several communities, Del Webb Orlando was our choice and we have not regretted our decision. The activities and events are scheduled and arranged with great thoughts in mind for all. There are so many clubs, it would be impossible to even try to name them all. The fitness program activities are available for any level. We love living here. We visited several times and the ppl we met were very friendly! Although we weren't thrilled with the long drive into the community, we were seriously considering buying here. We revisted again (our 3rd time) 2 weeks after the last hurricane (9/11) hit the central fl area and was surprised to see that the community was without electric.🤤 Just about every house had LOUD generators running however, my biggest SHOCK was the clubhouse & pool area! The place was dark and locked up! I would think that a retirement community would've provided their HOA paying residents an OPEN air conditioned clubhouse. Why doesn't the clubhouse have a generator? I'm moving AWAY from a barrier island I love, 2 blocks from the ocean because of hurricanes and a 2-3 wk loss of electricty. We visited other places in Davenport and they ALL had electricity. We found out that Polk County has issues.😕 Nice place, friendly ppl, questionable management when a hurricane hits. Do the right thing for residents, invest in a generator and OPEN the clubhouse. Residents need each other and some relief from the heat after a hurricane. The Del Webb community in Davenport Florida is one of the best 55+ communities my husband and I have seen. After much research online, then a trip down to Florida in person, we were so impressed we purchased our home there. The facilities are excellent, the neighbors friendly, and the activities are varied and has something for everyone. We lived in a 55+ community in Virginia, and Del Webb far exceeds the amenities that we had in our former community. We highly recommend Del Webb to those looking for an active 55+ community. you will not be disappointed in the community, the neighbors, or the affordability. In 2012 I began a serious undertaking-that of looking for a place to purchase a retirement home. Approaching this undertaking from an analytical view point, consideration was given to factors including weather, proximity to a major airport, tax considerations, affordability, quality of home construction and access to health care. Softer analysis (but just as important considerations)included a location that was enticing to family and friends to visit, menu of community amenities and activities, and the personal fit with people already living in the community. Using these factors, I visited communities in Florida, Arizona and Texas during 2012 and 2013 so I could make an informed and intelligent decision from an up close and personal experience. After careful analysis, my decision was to join the community at Del Webb Orlando. Del Webb Orlando ended up ranking first in each of the factors I utilized to make my decision. My advice to anyone looking to find a retirement home is to take the time to identify the factors important to them as they look to live their dream. Research those factors and then jump in and enjoy. Best wishes with your decision making. big purchasing event in my life! From the moment that I drove onto the beautifully landscaped Del Webb property until the moment that I walked into our beautiful new home the entire process was and is a skillfully orchestrated process! I did my homework prior to purchasing here! And I believe Del Webb Orlando is the best new home solution to your quest in a 100 mile radius! It's location is soo convenient to Orlando, attractions, international airport and Shopping (that is my passion)! The beautiful clubhouse is so current with the latest and finest workout equipment and an indoor and an outdoor pool! The poolside events are fun to attend! Golf and biking, walking paths, tennis court , pickle ball are all right here! And...if you love playing cards ( did I mention that this is another of my passions!) then come on and move in! Crafting and sewing and knitting and groups that meet to talk about the days' events in the world and local area...are fun too! And if IT isn't scheduled?? Then just get IT started! In other words there's something for everyone! AND my new home is everything that I ever dreamed of! The home selection was assisted by the fine sales team that are here! Then the fun began..picking out what you wanted your new home to. to look like inside and out! Onto the building stage..this company schedules you come into the unfinished home in different stages for your inspection! WOW that was a great step during the entire process! Finally your home is ready and the mortgage company, insurance and other information needed for your transition is made easier and smoother for you because they have it all spelled out for you right here! I am now settling into my beautiful new home, playing cards, shopping and loving the neighbors and new acquaintances. Hmm .. I forgot to tell you about the beautiful landscaping that comes with the purchase of your home! Just Lovely! It's Soo nice to drive through the community and up to your home and seeing all of the beautiful landscapes! I am so happy to be calling Del Webb my home! From the very first day that I contacted Sue Melton to the present ..Sue is and was a very personable sales professional! Her passion for the business of connecting people to their dream home is unquestionably the finest that I encountered on our pursuit of a home and community that I could love and live in! Another fine quality that I treasure in a person and sales professional is honesty! Sue demonstrated that quality through out the entire process! She skillfully guided us and yes at times went the extra mile! We were in the final process of signing on the dotted line..it was a rainy miserable day..however Sue offered to run and get lunch..and she even took our 2 dogs out for a walk in the rain ..so that we could continue selection process!!! We connected..viewed the model homes and loved the community! Yes we did purchase a wonderful 2 story home..we're just settling in and enjoy our new home ..our neighbors and the beautiful club house! If you are looking for a Real Estate Professional that is personable, helpful and extremely honest and sincere...then look no further! Sign me a Happy Del Webb Home Owner! Del Webb Orlando is a total ripoff. Before you buy, you should ask if the outdoor pool is heated - It's not. Want to swim after dusk on a warm summer night? - You can't! Like to sit out by the fire pit for an outdoor concert in the winter months? - Sorry that has been broken for a year! Miles of walking trails? Hmmmm No, more like sidewalks! Do you want to change something here at DWO? No, sorry. the PULTE controlled board is unresponsive. They only care about selling you a home. The hell with you after you move in. God forbid you have a warranty issue. This is a warm and friendly community. We looked for three years before we settled here. One of the main reasons was the golf course so that my husband could play daily. Waking up, getting in the golf cart and going to the course was very important to him. I'm all about the people, and I think we have the best here. They're our extended family, truely there if you need anything. Another reason was location, Disney just 15 minutes away, a place that the grandkids want to visit. Easy access to airport, and shopping, which I like to do. It's been 5 years since we move here and we are as happy now as we were back then. With that I totally recommend Del Webb Orlando as a wonderful place live. When I say we looked everywhere in Florida- I mean EVERYWHERE - east coast, west coast, north of Orlando - we saw many, many "over 55" communities. We settled on Del Webb Orlando, have been living here a little over a month and are absolutely ecstatic! The residents are wonderful - very friendly, welcoming and down to earth and the community is a beautiful setting of residential homes and spectacular landscape with a lot of green space. The amenity center is to die for - a state of the art fitness center (where you can watch your own personal tv while you are on the treadmill), beautiful pools, tennis and pickle ball - you name it! The clubs and lifestyle programs can keep you busy 7 days a week if you like. It is great to have a golf cart to travel to the golf course or just ride throughout the community and you absolutely cannot beat the location - who doesn't love Disney! The proximity to theme parks, shopping, the airport makes it so very convenient. We have only been here a little over a month and it already feels like home! This is a beautiful, quiet, gem of a neighborhood and we feel so fortunate to live here. Shopping and theme parks are nearby and the beaches are about an hour east or west. We believe we hit the jackpot finding this hidden oasis. I have lived in Del Webb Orlando for almost 5 yrs. I love it here and hope this is my last stop in life. It is one of the most friendliest places I have ever lived. Pepople are great, lifestyle program is great. I have made so many new wonderful friends and they just keep moving in.I could be busy seven days a week with doing things at our beautiful clubhouse or going out and doing things with friends. We also have location, location. It's so close to anything you would ever want to do or see.That means alot to me, I always hated having to travel so far just to go to dinner or the store and I like being close to the airport. The location of Del Webb Orlando and the many varied home styles available appealed to both my husband and I. 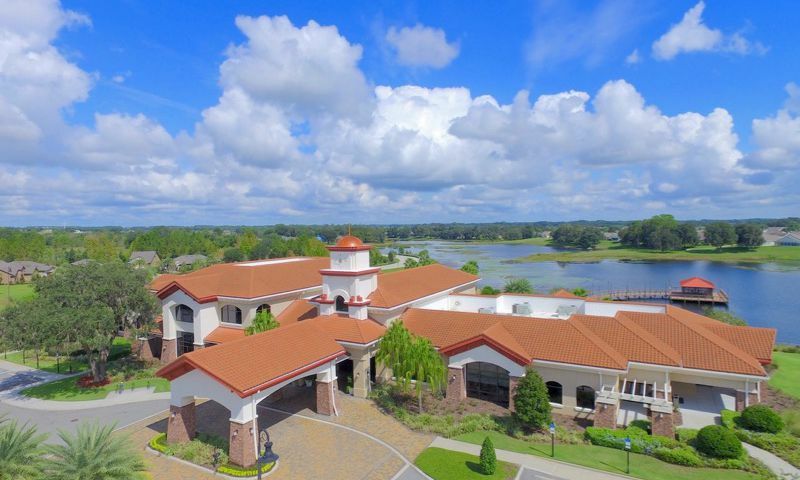 We were happy to find what we consider an ideal spot to make traveling to work (school and Walt Disney World), shopping and the airport all within an easy 5-45 minute commute. The ammenities at our Montecito clubhouse are resort-like; our tireless Lifestyle Director provides countless opportunities for fun and relaxation geared to the requests and interests of our community. Lastly, the diverse community is made up of caring everyday people who are looking to enjoy life and the social commaraderie afforded at this beautiful piece of paradise. 55places.com is not affiliated with the developer(s) or homeowners association of Del Webb Orlando. The information you submit is distributed to a 55places.com Partner Agent, who is a licensed real estate agent. The information regarding Del Webb Orlando has not been verified or approved by the developer or homeowners association. Please verify all information prior to purchasing. 55places.com is not responsible for any errors regarding the information displayed on this website.